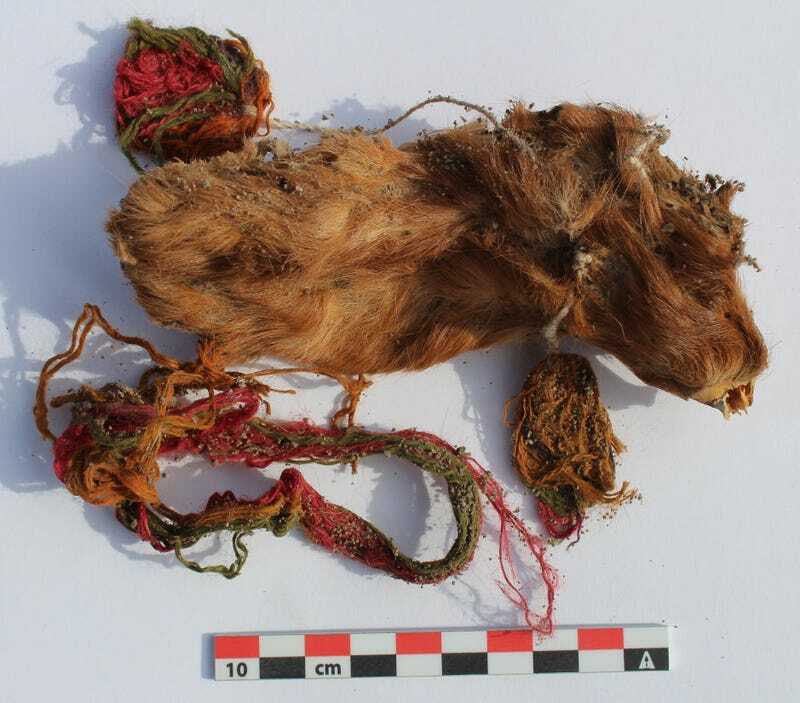 An intriguing new discovery in Peru shows ritually sacrificed guinea pigs were decorated with colourful earrings and necklaces by 16th-century Incas – a finding that comes as a complete surprise to archaeologists. New research published in the International Journal of Osteoarchaeology describes an extraordinary discovery at the Tambo Viejo site in southern Peru. The Incas constructed several administrative centres in the area, Tambo Viejo being one of them. Archaeologist Lidio Valdez from the Institute of Andean Studies, with funding from the Social Sciences and Humanities Research Council of Canada, uncovered 100 ritually sacrificed guinea pigs at two different locations at the site. This is a big deal unto itself, in that it’s the first bona fide archaeological evidence to support observations recorded by early Spanish colonisers of the Americas, namely the mass killing of guinea pigs during rituals. As such, the 100 guinea pigs at Tambo Viejo “represent the single largest find known for the entire former [Inca] territory,” wrote Valdez in the study. The ritual killings happened around 400 years ago, some two centuries after the arrival of Europeans to the New World. A total of 72 guinea pigs were found within an Inca structure, with another 28 at a different location nearby. Colours of the strings included orange, red, purple and brown. The guinea pigs likely suffocated after being buried alive; no signs of trauma were visible on the animals. Some were laid out individually, others in pairs or even groups. Small branches of a bush known as chilco were laid next to the sacrificed animals, and some charcoal found buried nearby suggests fire was used during the ritual. Guinea pigs of various colours were included, including fully black guinea pigs. Interestingly, 66 of the 72 guinea pigs at the first site, and 27 of 28 at the second site, were juveniles. These numbers “strongly signal that there was a high preference for the sacrifice of younger animals over older ones,” wrote Valdez in the study, of which he is the lone author. Guinea pigs were domesticated at least 5,000 years ago, Valdez told Gizmodo, representing “an important element of Andean culture, next to coca leaves and chicha,” the latter being fermented beverages. The young guinea pigs, he said, may have been favoured because of their tender meat, and possibly due to important symbolic associations with youth. For the ritual, clean sand was brought from a nearby river to bury the sacrificial animals. This, along with the dry, arid conditions of the area, allowed for the excellent preservation of the animals. After the guinea pigs were buried, a clay floor from an Inca dwelling was constructed on top of them, “thus sealing the offering animals,” wrote Valdez in the study. Looking at some of the specimens pulled from the site, the animals appear as if they were buried recently, while the colours of the string are still vibrant. Guinea pigs, he said, were only one of the many types of offerings given up by the Incas. At the same site, Valdez uncovered offerings of maize, chili, peppers and llamas. Edward Swenson, an anthropologist at the University of Toronto who wasn’t involved with the new research, was struck by the finding, saying he’d never seen anything quite like it. The colour of the guinea pigs, earrings and necklaces, he said, likely conveyed important symbolism, as colour coding was important in Inca ritualism. Fascinatingly, Swenson suspects the dressed-up guinea pigs served as substitutes for humans, and they may have been treated in very person-like ways. In terms of the sacrifice itself, Swenson suspects the guinea pigs were offered as foundation sacrifices at Tambo Viejo to animate or protect the buildings under which they were placed – a common practice in the Andes, both past and present, he said.